It made sense that playwright Kyoung H. Park took a moment before his play, Tala, to introduce the venue in which we sat. Founded over a century ago, The University Settlement in the Lower East Side is one of the very first community centers, a place where immigrants and their families could come, and still can come, to receive education, healthcare, housing, and, perhaps most importantly, a supportive and caring community. Park produced his play as an Artist-In-Residence with the Settlement’s Performance Project, a program with the goal of spreading the stories of smaller communities within our diverse city. 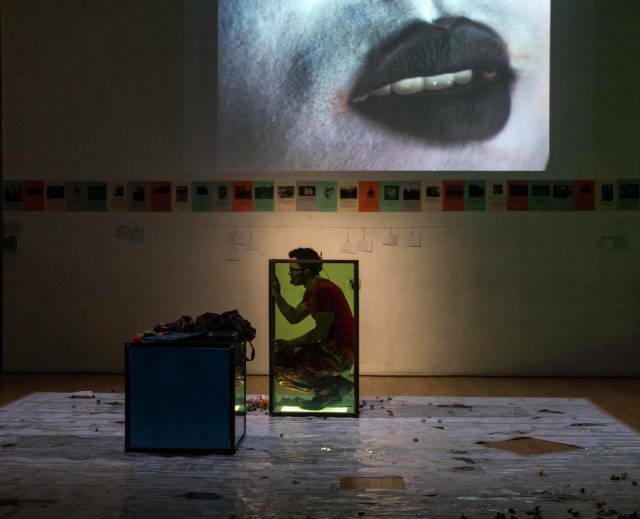 In Tala, Park weaves two narratives together in a metatheatrical conceit. In one story, Chilean lovers Pepe and Lupe meet on September 10, 1973, Lupe there with romantic intentions and dreams of marriage and Pepe there to halt Augusto Pinochet's U.S. backed military coup, which took place the following day on September 11th. 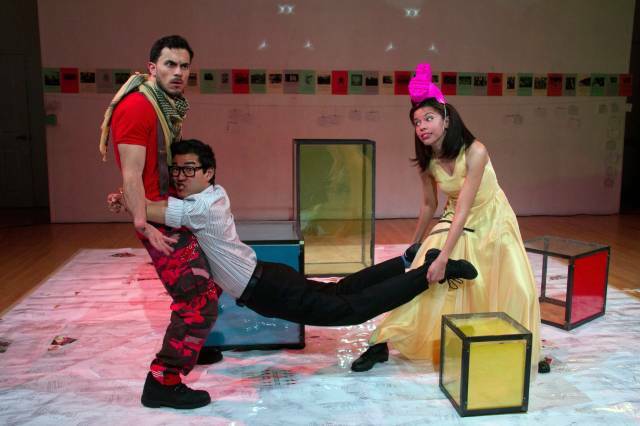 In the other story, Park, who only became a United States citizen in 2014, gives a semi-autobiographical account of his experience as a gay Chilean-Korean playwright, educated at NYU during the 9/11 terrorist attacks, searching desperately for a true sense of identity and belonging. Both tales are couched as a rehearsal of the play about Pepe and Lupe that Park has written. Pepe, Lupe, and their unseen, murdered friend Federico are based on the lives and words of revolutionaries, diplomats, and poets Pablo Neruda, Gabriela Mistral, and Federico García Lorca, creating a poetic dialogue which headbutts against the colloquial, modern prose of Kyoung’s scenes. As the story progresses, the universes collide, both within the world of the narrative and outside of it, as the actors embody different characters, characters go "off book," and members of the crew interrupt the action with comments and complaints. This experimentation with the constraints of traditional theater can be comedic and almost madcap at times, highlighting a layered narrative in which character is incredibly fluid, but overall Park and his skilled ensemble create a surrealist vision that is deliberately jarring and thought provoking, challenging us to reflect on the privileges of identity, community, and citizenship that we so often take for granted. Rafael Benoit, Daniel K. Isaac & Flor De Liz Perez in TALA. Photo by Talya Chalef. Tala tackles large, almost mythical dilemmas, such as the burden of inheriting a national identity and the complexities and confusions that arrive when we inherit more than one. Park explores what we must accept and how we can grow, pushing beyond what is expected of us as obedient sons, daughters, and citizens. Kyoung is fearless in his willingness to leave his life and the trials of his past out in the open, and by merging the story of Pepe and Lupe with that of the playwright, he shows the intersection between the personal and the political, exploring the implications of following a cause to the extreme, given the potential that in doing so you may have to give up on the hope of "normalcy" -- for Lupe a house and kids and a life as a homemaker, for Kyoung the possibility of a stable national identity and a successful, intimate relationship. Rafael Benoit, the primary actor of Pepe, Flor De Liz Perez as Lupe, and Daniel K. Isaac as Kyoung and Matt, an ex-lover of Park’s, give emotionally powerful performances that show an impressive range capable of carrying both the lighter, sarcastic moments and the heavier, more disturbing elements as well. Their performances were notable for their physical willingness as well, as the play involved many moments of closeness, of dance, and of frantic movement across the stage. The Performance Project is, in essence, about giving a voice to those who have been denied one, about fostering community and growth through the arts. In Tala, Park tells his story, perhaps the first about a “gay Chilean-Korean terrorist,” and escalates his hope and belief one step further, leaving us with the possibility that perhaps the pen is indeed more powerful - far more powerful - than the sword.